We’re not all content writers, so it’s probably safe to say that most people don’t think much about the content creation process and the life cycle that a blog takes from conception to published state. Most of us simply peruse the news feed looking for some great content without really thinking where the idea for the blog originated – that simply a light bulb goes off in the writer’s mind, and just like that, 500 words grace our computer screen. This isn’t necessarily the case at TPM. We pride ourselves on our very thorough blog process. Why? Because we feel that the time and love we put into creating our quality content shows, and content is key to a long-lasting relationship with your target audience and potential customers. Why Do We Feel That a Quality Blog is Important? Inbound marketing delivers 54% more leads into the marketing funnel than traditional outbound marketing. So we feel that the right content – whether it’s a blog, an eguide or an infographic – can fill your marketing funnel with qualified leads. When these qualified leads are nurtured, they turn into a sale. Content = Sale. Sold? Ok, so how do we do it? If you are new to content marketing or haven’t cared much about it until now, keep reading as I take you through our entire blog process from beginning to end. Most good ideas start with a problem – a pain point, something that you need to change, improve or solve. 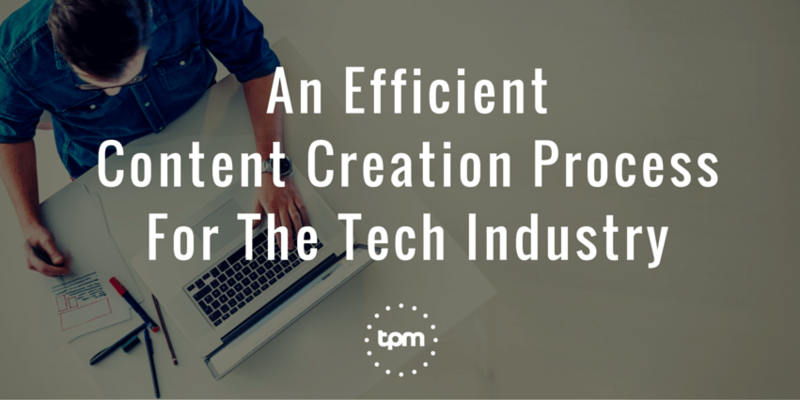 At TPM, we begin the content creation process by brainstorming potential problems that our customers – or our clients’ customers – may be looking to solve. The concept may come from something that is trending, or a topic related to the cloud and hosting industry that has been in the news, or simply, we will ask our clients about issues that they are looking to solve in their business. Enter strategy team. Our strategy team consists of Makiko, Jase and myself. Once we chat with the client and confirm the concept idea, we as a team will take the concept and run with it. Next up: Keyword research. Jase is our Director of SEO & Analytics at TPM and he takes care of the keyword research for our content. Before we start the content creation process, we want to make sure that the idea we came up with is actually, in fact, a good idea. How do we do this? We research the keywords that are relevant to the topic we wish to write about. We focus on the keywords with good search volume; in other words, we write about topics that people are searching for. At TPM, we take the keyword part of the process pretty seriously and ask ourselves the following questions when determining the keyword(s). What product or service are we selling, and what problem does it solve? Who is the target customer, and what problems do they have? What would make a good topic? What keyword is our target customer searching for when they search for that topic? Do we have the right intent behind this keyword? Will our page attract the right people? What is the likelihood of ranking #1 for that keyword? Who is our competition, and can we compete? At this stage the buyer acknowledges and communicates signs of a problem or opportunity. The potential customer will be looking for content that should help them understand their problem. At this stage we would create content such as white papers, eguides or analyst reports. At this stage, the buyer has outlined and named the problem and opportunity. Potential buyers will benefit from comparison eguides, white papers or video tutorials on how they can solve their problem. The buyer has defined the strategy during this stage and they are researching content to help them make a decision. This stage requires information on your company, such as case studies, product shell sheets and demos, to make them see that you are the best solution for their problem. Content that works best for the decision stage are vendor and product comparisons, case studies and product literature. Step 3: Quality Content is Key! The TPM content team consists of Cindy, Alisha, Karin, Norshin, Irene and Mel. Each with a different industry background and subject matter expertise. We will assign each blog to the writer whose industry experience is a match with that of our clients’ industry or the blog subject matter. Once we have assigned a writer to the task, the writer does the additional research required to write the content that reflects the keyword or key phrases. Quality content is key – the piece should be informative, engaging and a pleasure to read. We prefer longer, quality pieces vs. shorter blogs because the search engines prefer this, and so do we. We also like to use numbered or bulleted lists to make it easy for the reader. We also include a call to action on all pieces of content. The call to action should be clear, prominent and will make the reader take action! Our goal is to provide content that is organized in a methodical way, is easy to read, makes sense for SEO and will make people want to link to it. Once the draft blog is complete, it is sent back to the strategy team for review. And this time, we editors get out our red pens and make our revisions and comments. Once we are happy with the draft copy, it will leave our hands and go to the designers. At TPM, we believe that visual and emotional triggers are at the heart of any successful digital marketing campaign. So, in other words, we like pretty pictures in our blogs. But it’s not just about pretty pictures; 40% of people will respond better to visual information than plain text. What’s more, articles with images will get 94% more views. Sometimes our blogs require more than just a pretty picture – they may include a graph, map, image, or design – something that we can use to get our point across. Our designers will take a look at the keywords, title and content and will search for images that we can use in the blog. We use images that are relevant to our blog topic and steer clear of overused stock imagery. If there is an opportunity to use an infographic, we are all over it. Did I mention that our Director of Design & Development, Lisa, is a big fan of infographics? Lisa, Sebastian and Julie are in charge of making us look good. Once the imagery has been selected, the strategy team will approve the images and take another look at the assets before it goes to marketing automation. TPM is a HubSpot Certified Gold Partner, and we use HubSpot for our own inbound marketing. HubSpot is easy to use – I can schedule, share and track all inbound marketing, including emails, blogs, landing pages, as well as social media – right from one dashboard. What I really love about it is that I can also manage several accounts right from the same dashboard, so I can see how our content, and our clients’ content, is performing in real-time. Juneko, Makiko and Julie are our HubSpot experts and they take care of the marketing automation. Once our team posts the blog and images on the WordPress site, the strategy team will review the blog and imagery in its final form, for one last and final time before the client sees it. In the meantime, our HubSpot experts will post the supporting content – email, landing page and social media to promote the blog to HubSpot. The client will now have an opportunity to review the blog in the final form prior to it being published. At this point, the client provides feedback, and when the client is happy with the content, it comes back over to TPM for final preparation. An accurate and a concise description of the page’s content. This will help the readers find what they are searching for — as well as help with SEO. Alt text that conveys details about the images in your piece. This will provide information in the event that the image is not available to the reader. A descriptive filename, using hyphens, further helps Google to know what is contained in the image. Compelling yet concise information on what the page is about in terms of content. This helps boost your rankings with search engines. No duplicate H1 tags, H2 tags for subheadings with H3 and H4 headings underneath. While the SEO value of using headings isn’t what it used to be, following best practices shows Google that you are doing your best to provide quality content. When Jess is done, the editors from the content creation team will go over the blog with a fine tooth comb. They look for overlooked grammatical errors, irregular font, formatting issues and they also ensure that the images and design elements look good. Once it has received a green light, it moves back to the strategy team, one last time, for its final stamp of approval before it moves to publishing. When the strategy team is happy with the finished product, they will push the red button and a blog is born. Like a hot potato, whomever touches it last, set’s the blog to publish. But we aren’t done yet. What good is your blog if no one see it, right? A blog should inform and educate and hopefully be seen by as many eyes as possible. Alisha, Director of Social, makes sure our content gets read. Not only does she work hard to push it out via social media, but she will also look for opportunities to connect and engage with social media followers and influencers to share our content. Like I mentioned above, we will establish in the strategy phase if there will be anything accompanying the blog – such as an email to a subscriber list, with a link back to the original content on our site. The more ways to share the content, the better. Clicks from shared content are 5 times more likely to result in a purchase. There you have it, our content creation process and the life of a TPM blog, from beginning to end. Our process is methodical, which I think is why we are able to create a lot of great content. We love creating content and I hope it shows. If you have any questions about your next content marketing strategy, or need help creating organic content that will convert to leads, contact us, we’d love to chat. Contact us today to learn more about how Total Product Marketing can help.